DESCRIPTION: Integrated Water Services, Inc. (IWS) completed the installation of a 22 AX-Max wastewater treatment system for the City of Alexander, ND in December, 2014. Alexander is located 15 miles south of Williston, the hub of the Bakken Oil Field region in western North Dakota. The shale oil boom has resulted in rapid growth of the Bakken region, and the City of Alexander needed to replace its aging three cell lagoon which was approaching its operating capacity. The new plant is designed to treat 150,000 gpd of municipal effluent. The AX-Max is a packed bed media filter technology manufactured by Orenco Systems, Inc. (www.orenco.com) which is built inside an insulated fiberglass tank that is durable, lightweight, and watertight. The AX-Max units were installed above ground in Alexander, but can also be installed belowground, singly or in multi-tank arrays. 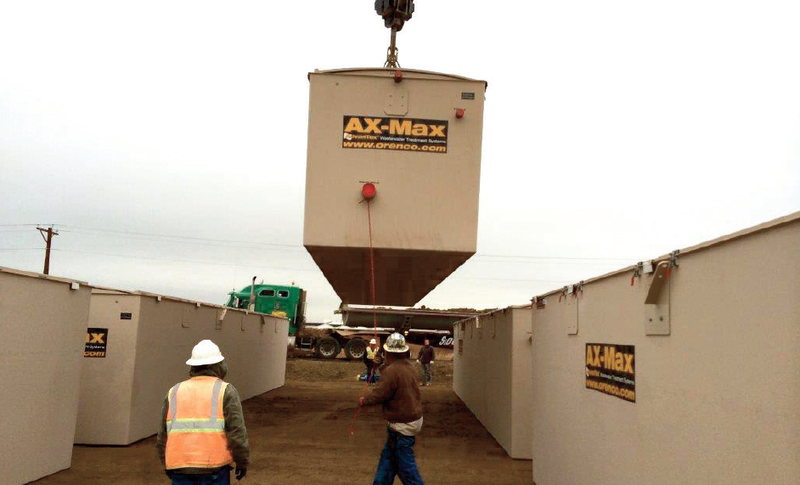 In harsh climates like in North Dakota, one of the AX-Max units was configured as a prefabricated control room. The modular design of the Orenco plant enables the town to accommodate its fluctuating seasonal flows – reduce the number of operating AX-Max modules in the plant during the winter months when activity in the Bakken slows down and then bring modules on-line as capacity is needed during the warmer months. IWS was subcontracted by Knife River Construction (www.kniferiver.com) to install the AX-Max treatment system based on IWS’s extensive experience constructing Orenco wastewater plants throughout the western US. There was a very tight construction schedule as the units needed to be online before the winter season set in. The plant was constructed in two phases consisting of approximately 2 weeks each. The IWS construction scope included all interconnecting piping, electrical controls, start-up and testing. All treated effluent from the system is discharged seasonally to nearby surface water.